« Has Italy Passed the Point of No Return for Statism and Big Government? I wouldn’t be too upset about Hillary Clinton winning the White House in 2016, but only if I somehow could be assured that we would get the kind of policies we got when her husband was President. After all, economic freedom increased during the 1990s, largely because of a smaller burden of government spending and less intervention. Indeed, it’s worth noting that she was a doctrinaire statist when she was in the Senate. Here’s what the National Taxpayers Union revealed about her performance in her last year in office. Sen. Hillary Clinton…received a score of 4 percent and the title of “Big Spender” in 2008 — a slight increase from her 2007 rating of 3 percent. The good news, if you have the ability to detect very small silver linings, is that her score did increase in her final year. And it doesn’t appear that she’s learned anything since she left the Senate. Consider some of the bizarre statements she has made in the past few years. Mrs. Clinton said we can’t end the War on Drugs because “there is just too much money in it,” apparently oblivious to the fact that high profits for the cartels only exist because of criminalization. And she bragged about paying above-average taxes, apparently thinking that the inability to manage her personal finances makes her an attractive choice to control the nation’s finances. Now she’s added to the list. Here’s what she said the other day about job creation. Wow. I’m not even sure what to say, other than I wish somebody would ask her where jobs do come from, the Tooth Fairy? Santa Claus? I’m pretty sure, if pressed, she would use the same argument as her potential 2016 rival, Elizabeth Warren, and claim that government enables all the jobs by providing infrastructure and other public goods. But there are roads and police in places such as Cuba and North Korea, yet we don’t see jobs there. Or, to use more reasonable examples, France, Italy, and Greece have lots of roads and cops, yet all of those countries have very weak labor markets. Maybe, just maybe, you also need some breathing room for private enterprise if you want robust job creation. An editorial in the Washington Examiner correctly observed that Hillary Clinton’s comments demonstrate ignorance of basic economic principles. …the private sector accounts for 84 percent of American jobs. But one must remember that the private sector also accounts for 100 percent of the wealth America creates. Meanwhile, government is funded exclusively through various taxes on private production and accumulation of this wealth — and that includes any taxes that fall upon the portion of privately created wealth that government collects and then uses to pay its own employees. This insight should be brought to Clinton’s attention, because Americans cannot afford to have one of their two major political parties reject basic economic principles. I also like that the editorial explains that even public goods wouldn’t be possible if the private sector wasn’t creating the wealth to finance them. P.S. Yes, I realize that many of the good policies America enjoyed in the 1990s were driven by Congress. 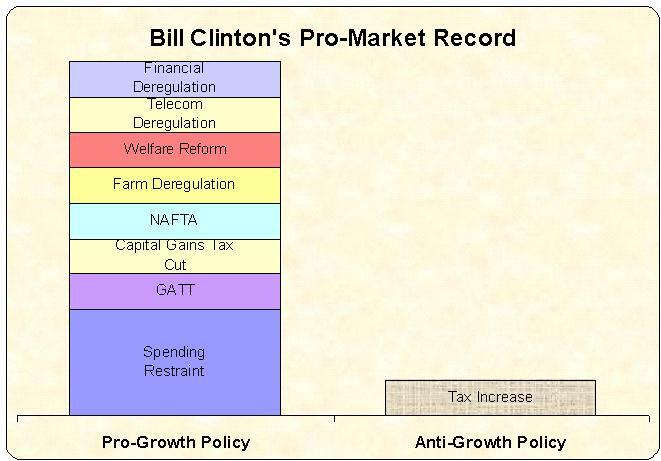 I’m not saying the Bill Clinton deserves credit for those policies. Instead, I am merely pointing out that they were implemented during his presidency. P.P.S. That being said, it’s worth noting that Bill Clinton seems much more rational than either his wife or the current President. P.P.P.S. Since I mentioned statist heroine Elizabeth Warren, this is a good opportunity to recycle some humor. Here’s some mockery of her make-believe Indian ancestry, and here’s a clever application of her philosophy to dating choices for attractive women. P.P.P.P.S. Here are some additional Hillary quotes as part of an amusing quiz. P.P.P.P.P.S. One final point. I’m not sure who deserves the credit, but somebody in the Clinton household believes in proper (albeit hypocritical) tax planning. It seems they must promote thier group no matter what…even if you do not agree with it. I would love to see Bill’s real thoughts on this topic. Maybe Bill Clinton was rational once upon a time but there were no signs of it in his recent speech in Denver. He was promoting the Democrat choices for Senator and Governor and he just made no sense. I guess there is too much nonsense to overcome when you are trying to promote those two.